A series of earthquakes struck Central California Friday morning, according to the U.S. Geological Survey. There are no reports of damages or injuries but the shakes were felt in the South Bay. Robert Handa and Janelle Wang report. A series of earthquakes struck Central California Friday morning, according to the U.S. Geological Survey. There are no reports of damages or injuries but the shakes were felt in the South Bay. 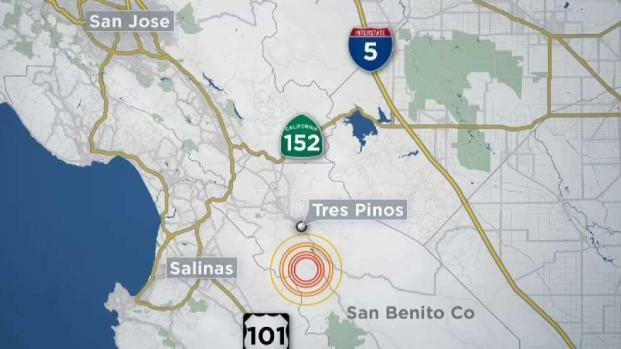 The U.S. Geological Survey website had hundreds of reports of people feeling a magnitude-4.1 quake that struck first at 5:58 a.m. Friday and was centered 7.5 miles south of the town of Tres Pinos, about 55 miles south of San Jose. It says a magnitude-3.2 temblor hit three minutes later in the same area. A third quake with a magnitude of 3.0 was reported soon after. The survey says a fourth earthquake was reported at 6:22 a.m. 8 miles south of Tres Pinos. Dr. Brian Kilgore with the U.S. Geological Survey explains the series of earthquakes that hit Central California Friday morning. People from the Pacific coast in Monterey County to the north in San Jose reported feeling them.